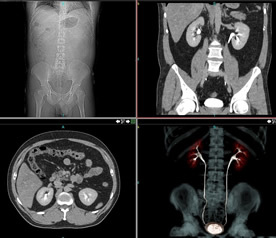 CT or Computed Tomography has been an invaluable part of medical imaging since the 1970’s. 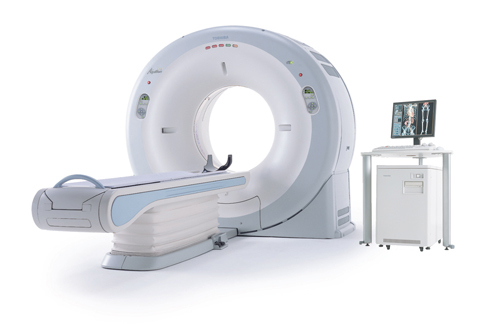 The CT scanner resembles a large doughnut and is open on both ends (image to the right). Like radiography, CT uses x-rays to produce images; it does not use magnetism like an MRI. To understand what your CT images will look like, imagine your body as a loaf of bread. If you were to pull out a single slice and look at it, that would be a rough equivalent of an axial image. At Idaho Urologic Institute we use a Toshiba Aquilion Lightning 16 slice scanner. With this scanner we are able to acquire as many as 16 images per tube revolution. With revolution speeds as high as 1 rotation per half second, we are able to cover a great deal of anatomy in a matter of seconds! As a result, we are able to generate high quality images in a timely manner. Recently, there has been a great deal of media coverage concerning radiation doses received during CT imaging. At IUI we strive to always keep patient doses under the American College of Radiology’s recommended dosage levels. The dose you receive during your imaging will be recorded in your medical record. Our most effective means of limiting patient radiation exposure is by providing experienced technologists who are credentialed through the American Registry of Radiologic Technologists and understand the importance of dosage levels. You will need to drink 16 ounces of water 15 – 20 minutes prior to your scan. You will drink 8 ounces of water just before the technologist takes you back for your scan. You should continue to take all necessary daily medications unless instructed otherwise (see “diabetic patients”). During your exam, you will be given IV contrast. If you have known allergies to IV contrast, iodine, seafood, or strawberries, please make the technologist or your nurse aware of this no less than 24 hours prior to your exam. Some allergies may require the use of pre-medication to prevent an allergic reaction to the IV contrast.